Explanation: Where are the Milky Way's gas clouds and where are they going? To help answer this question, a new highest-resolution map of the sky in the universe's most abundant gas -- hydrogen -- has been completed and recently released, along with its underlying data. 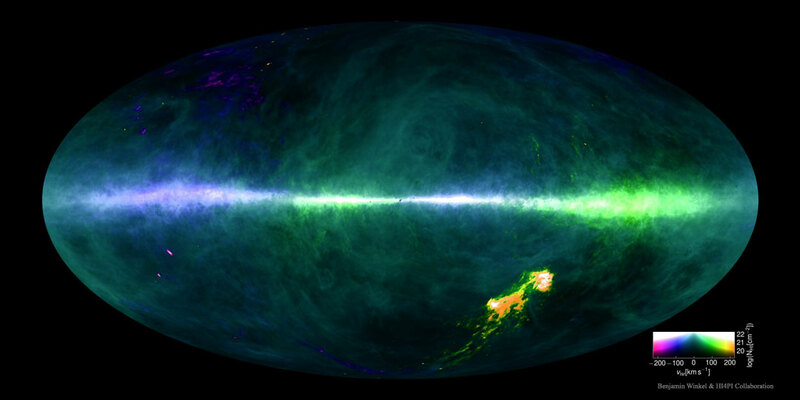 Featured above, the all-sky map of hydrogen's 21-cm emission shows abundance with brightness and speed with colour. Low radial speeds toward us artificially coloured blue and low radial speeds away coloured green. The band across the middle is the plane of our Milky Way Galaxy, while the bright spots on the lower right are the neighbouring Magellanic Clouds. The HI4PI map collects data from over one million observations with the northern Effelsberg 100-Meter Radio Telescope in Germany and the southern Parkes 64-Meter Radio Telescope in Australia, also known as "The Dish". The details of the map not only better inform humanity about star formation and interstellar gas in our Milky Way galaxy, but also how much light this local gas is likely to absorb when observing the outside universe. Many details on the map are not yet well understood.